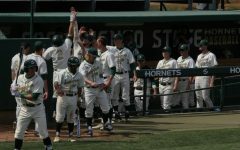 Sac State outfielders junior Matt Smith (left) and senior Bronson Grubbs (right) high-five teammates upon returning to the dugout in a 5-4 win Sunday over CSU Bakersfield at John Smith Field. Since beginning the season 3-6, the Hornets have gone 18-4 and are currently first in the Western Athletic Conference. 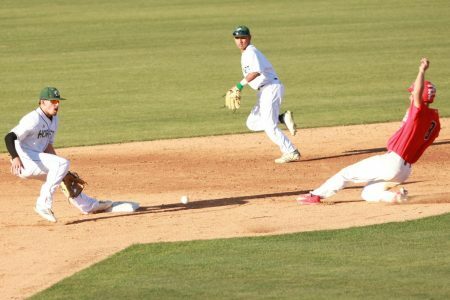 The Sacramento State baseball team returned home to John Smith Field Friday for a three-game weekend series against Western Athletic Conference rival, the California State University, Bakersfield Roadrunners. The Hornets (21-10, 7-2 WAC) and Roadrunners (15-18, 3-6 WAC) played three very competitive games, but Sac State swept all three games with two wins coming on walk-off hits. 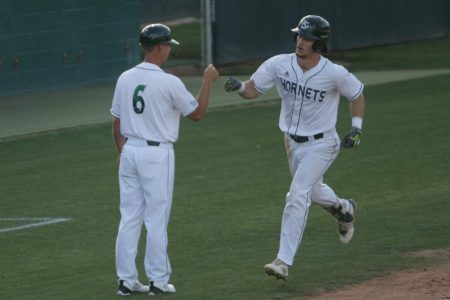 Following a 12-1 homestand ending with a victory against University of California, Berkeley, the Hornets hit the road for their first WAC road series of the year against the California Baptist University Lancers. In the first game of the series, the Hornets and Lancers scored 31 total runs. 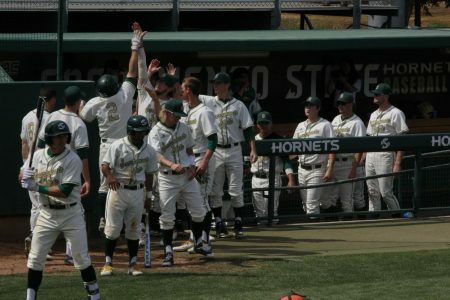 Sac State won game one of the series 21-10. The Hornets had 19 hits and drew 11 walks in the win. 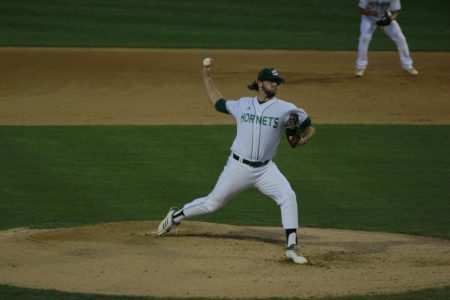 Sac State and Cal Baptist were tied at 10 after the fifth inning until the Hornets scored 11 unanswered runs with two in the sixth inning, four in the eighth and five in the ninth. The Hornets set a new record for most runs scored in a WAC game (since 2006) and tied for fifth-most runs scored in Division I history (since 1991). 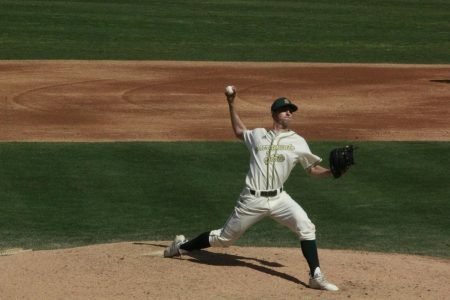 Sac State dropped the second game of the series with a narrow 6-5 loss to the Lancers. In the final game of the series, the Hornets sent sophomore right-handed pitcher Scott Randall to the mound in the decisive third game. 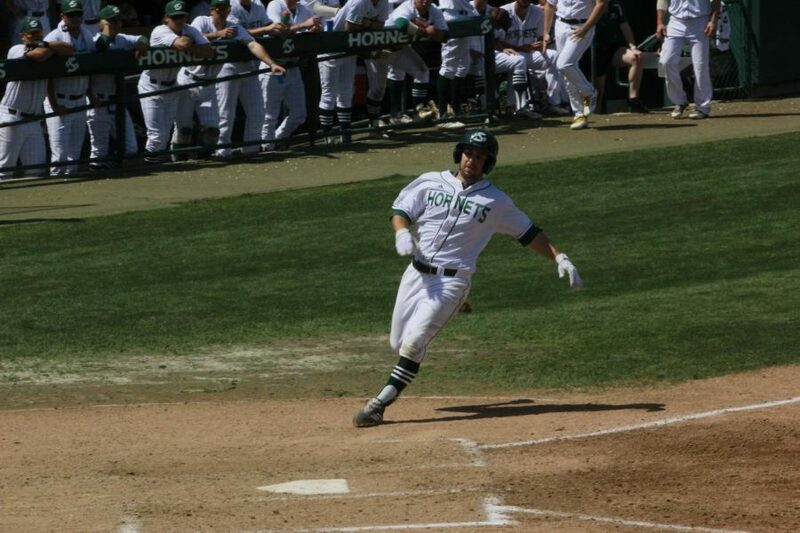 The Hornets scored first with a sacrifice fly from sophomore infielder Keith Torres, the team’s only run of the game. One run was all that Randall needed as he was lights-out against the Lancers. Randall pitched a complete game shutout allowing only two hits with five strikeouts in the series win. 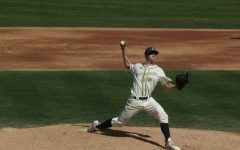 Sac State was scheduled to play a home game April 2 against Menlo College to replace the Feb. 26 road game against University of California, Davis, which was canceled due to rain. The contest against Menlo was also canceled due to rain. 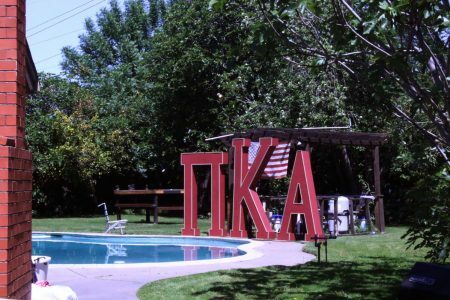 The next day, the Hornets traveled to Reno, Nevada to play a single road game against the University of Nevada Wolfpack. Sac State scored first and got one run in the first inning on a single by Smith. The Wolfpack went on to win the game 6-2. The Hornets returned home Friday for a three-game weekend series against Bakersfield before hitting the road for a season-long nine-game road trip. Senior outfielder Bronson Grubbs prepares to slide into home plate in a 5-4 win Sunday over CSU Bakersfield at John Smith Field. Grubbs had one hit, one run scored and one RBI in the win. In game one, the Roadrunners scored one run in the top of the ninth inning to tie the score at three and send the game to extra innings. 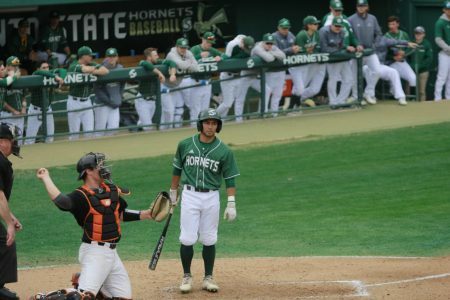 In the bottom of the tenth inning, Sac State sophomore catcher Dawsen Bacho singled to left center field with the bases loaded, winning the game. 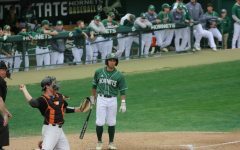 The Hornets opened the second game of the series with nine unanswered runs to hold a commanding 9-0 lead after five innings. The Roadrunners led a comeback charge in the sixth and seventh inning, scoring seven total runs to cut the lead to two. 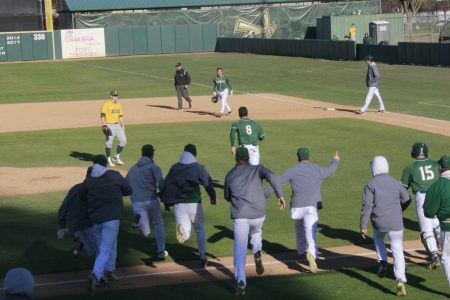 Sac State was able to tack on one more run in the eighth inning to hang on and win the game 10-7. In the final game of the weekend, Sac State and Bakersfield had a closely contested affair. Both teams scored three runs in the second inning. The two teams each scored one more run and were tied at four points going into the ninth inning. With the bases loaded and one out, Moretto hit a single to left field to score the game-winning run and give his team the series sweep over the Roadrunners. Moretto gets the game winning hit for the Hornets, the team’s second walk off of the weekend to sweep CSUB. Smith continued to hit the ball well over the weekend. 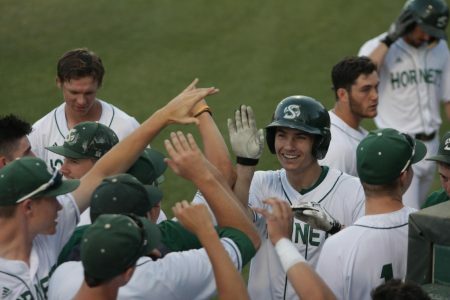 In the three wins over Bakersfield, Smith scored seven runs and had seven hits, seven RBIs and three total walks. 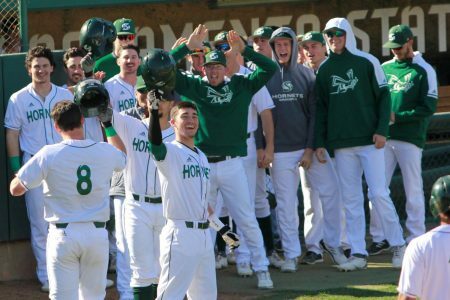 With 21 wins on the season so far, the Hornets are now one of 58 out of 299 total teams with 20-plus wins in Division I baseball across the country. Sac State will play two-thirds of their games on the road, with only eight of the remaining 24 games at John Smith Field. The Hornets are now headed for a nine-game road trip. Sac State will play single games against Santa Clara, Illinois State and Cal. 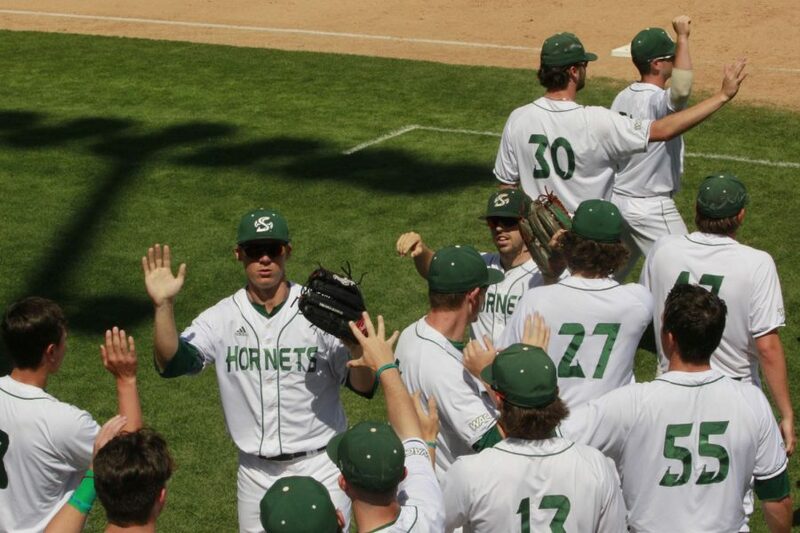 The Hornets will also play three-game series against WAC opponents Seattle University and Chicago State.